The photo id for this photograph is 45, in the Trains and Railway Lines album. This photograph is taken at the Kinder Reservoir construction site above Hayfield sometime between 1908 and 1912. 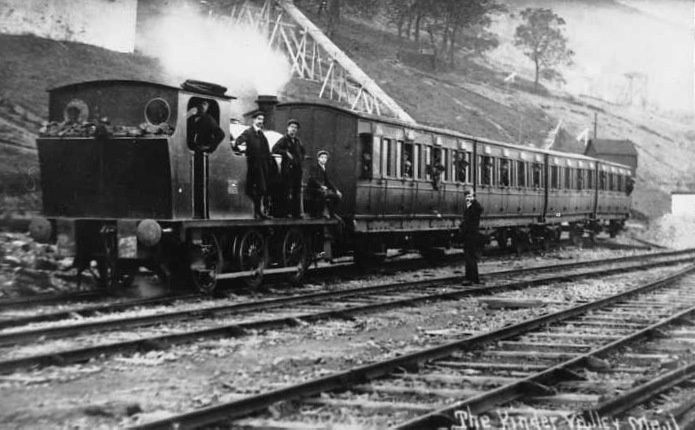 The carriages had previously been used by the Mersey Railway, and were used to take the navvies to and from work, as most of them lived either in Hayfield or in a temporary village of tin huts by Booth Bridge.